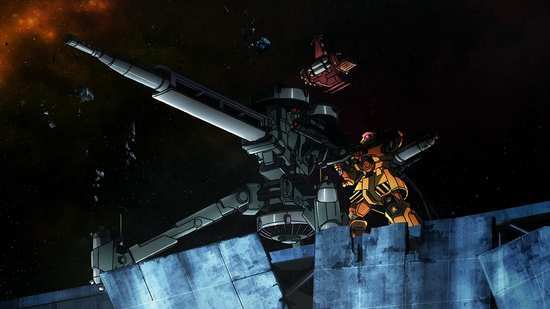 The Gundam franchise rolls ever on and shows no sign of running out of fuel anytime soon. Whilst I really enjoy the earlier shows, with their retro anime look and feel giving a welcome blast of nostalgia, the newer shows have been pretty good too, remaining faithful to the narrative and atmosphere of the originals. 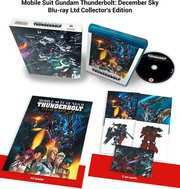 I’m pleased to say that the astonishingly lengthy titled ‘Mobile Suit Gundam Thunderbolt: December Sky’ movie is no exception. Despite being a paltry 70 minutes, it’s a blast from start to finish. It would probably help a little to have some knowledge of the so-called ‘Gundam Saga’ though this isn’t essential. The back-story adds a richness to the characterisation that would otherwise be missing perhaps, and some of the phrasing (like ‘he’s a new-type’) may pass new viewers by, but the story here is pretty straightforward. In common with much of the preceding series, the line between who are the ‘goodies’ and who are the ‘baddies’ is often blurred. Things are looking pretty desperate for the Zeons who have resorted to enabling the so-called ‘Living Dead’ to fight their cause; young soldiers for the most part who have lost limbs in previous battles but who still want to fight for the cause. An endearing, if naïve, soldier, Daryl Lorenz, is a prime example and much focus is put on him in this intertwining tale. Whilst the Zeons are generally portrayed as the less moral and more aggressive in the war, their rivals, the Earth Federation, are perhaps no better. In fact, they seem to be losing the plot with a female commander who appears to be having a nervous breakdown and is addicted to drugs. Thankfully she has a mad maverick onside in the form of Io Fleming, a crazed soldier who lives like there’s no tomorrow and who enjoys out-there, free-expression Jazz music when he is in battle, which makes for some of the finest scenes in modern anime. Who wouldn’t want to hear John Coltrane like shrieks and whistles as they battled for their life? It’s a madly surrealistic idea which just works. As in all the best war movies, it becomes personal when Daryl and Io repeatedly go into battle which becomes a battle of the bands as Daryl has a preference for sugar sweet pop accompaniment in his suit compartment. Each of these unlikely heroes gets their own new mobile suit, upgraded versions of the Gundam for Io and a new ‘Psycho Zaku’ for the near-limbless Daryl. The story is pretty straight-forward as far as it goes, but ends on a slightly un-satisfying note, I guess to gear up audiences for the next instalment of the on-going saga. And really, the highlight of the film’s all too brief but perfectly formed 70 minutes are the battle sequences; some of the most elegantly choreographed action witnessed by this particular reviewer. With the soundtrack flitting between free-form jazz and Japanese pop, these incredible scenes are flowing and sublime; almost hypnotising in their brilliance. Although I love the staccato, film-cell animation of old, you’d have to be a real curmudgeon and original Gundam purist not to admit that this is really excellent stuff indeed. On that note, despite the film reflecting the very best of modern animation techniques, it is also highly respectful of the original series and there is no question that we are in the same Universe. In a way, it manages to retain that retro charm, giving us the very best of both worlds. I elected to view the film with the US dub which was excellent. Image quality was good too with some knock-out colour choices that made this a visual feast. In common with many anime releases, extra features are relatively slim pickings with some promos and trailers, for the film itself and for other releases. I received a check-disc for review so can’t comment on the packaging but it looks like the special edition comes with some tasty extras though like an A5 poster and five art cards. 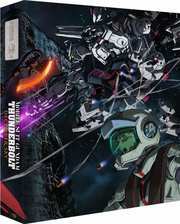 All in all a great addition to the Gundam saga and a really well-executed, fun film which is a blast to watch. It will certainly get a re-watch some time soon, which is not a reaction I often have to anime releases. On the down-side, it is a bit short (the length of a couple of episodes) and the disc could have benefited from some additional goodies. But overall, this is highly recommended.